Which of the following two photos do you think looks better? The second photo is an artist’s impression produced by Cycling UK. It was a year ago last month that I discovered the city council had no plans for a bike path through the city centre. I knew I had to fight it. It just took me a year to summon the courage. I also did an interview with BBC Radio and Original FM. I don’t have web links for these but a couple of people told me they heard the Original FM one and said it was good. On the whole Aberdonians have been really supportive. I have come across a few objections on social media but they are a minority and often their objections are irrational. One person told me cyclists don’t deserve bike paths because we don’t pay road tax. My response now is to suggest that if they think my 8-year-old daughter should pay vehicle tax for her bicycle then they need to take it up with Westminster (there’s no such thing as road tax which was abolished in 1937). Often these people are deliberately contrary. They complain about non-issues without recognising what the real problems are. These are childhood obesity, an NHS in crisis, traffic congestion, pollution, climate change – the humble bicycle can solve all of them but only if there’s safe space for cycling. 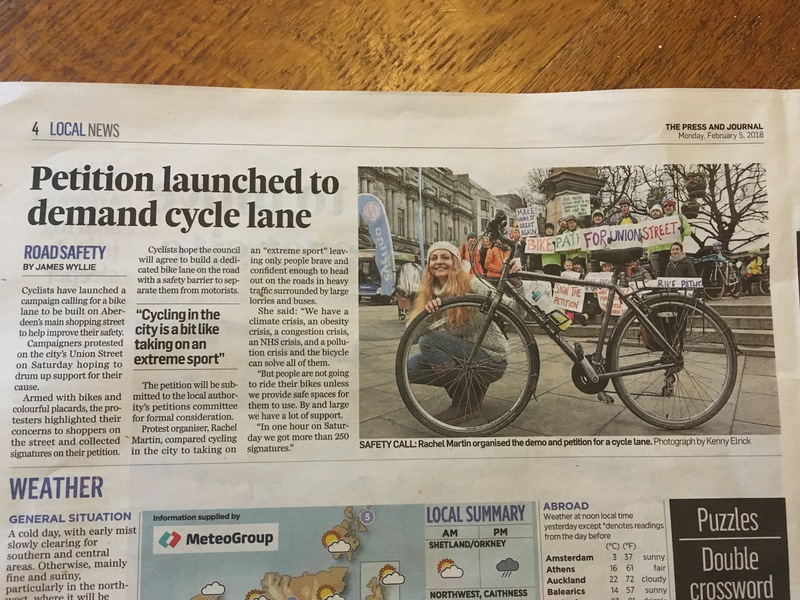 Let’s bring real solutions to the table and turn Aberdeen into a modern city that truly promotes active travel. Posted in Cycling and tagged Aberdeen, bike paths, bikes, cycle, cycling, Scotland, transport, transportation. Bookmark the permalink. The 2nd photo is more spacious and thus looks better. I hope you prevail. I wish we had you in our community. My community sprung for the cost of painting some lines for bike paths but would never consider the cost of bollards. Even with bollards, I wouldn’t feel safe considering the wild abandon way people drive here. Besides, the way the original roads were designed without a thought to bicycles or pedestrians, making the roads safe for bikes now would be a major undertaking and expense. Interestingly, the first target for such an effort in my town would be a street situation similar to the one in your picture. It lends itself to being a mall area for bikes and pedestrians. There is a bypass nearby that could easily take up the relocated vehicle traffic. The primary resistance comes from the business owners that believe they need the visibility from all the cars passing by. So far they reject the idea that making it more inviting to pedestrians and bikes just might attract more customers. At least there was something of a compromise in that parking is permitted on both sides of the road, narrowing it and slowing the speeds down a bit. The constituency to move the cars out still exists and the perennial battle continues. I hope you get some progress. The weekend before the protest I approached some of the businesses on Union St to get their thoughts on a bike path and they were all supportive. There was just one who didn’t want it and his objection was that bus passengers would have to walk through the cycle path. I don’t think this is a problem because that’s how it works in the Netherlands (they have floating bus stops) and parts of the UK that have cycle paths. If the choice of conflict is between a bus and a cyclist or a pedestrian and a cyclist then we should always choose the latter because the difference in mass is much smaller and potential accidents will be far less severe. Have you ever asked individual businesses on the street what they think? Sometimes the objectors are just one or two in number but they have loud voices and it makes the opposition seem much greater than it really is. Cycle lanes are great, as long as pedestrians even bother looking as they walk into them. I spend much of my time on the road second guessing what pedestrians are about to do. Yes, that is a problem, I agree. The Dutch separate bike paths with pedestrians paths with a 45 degree kerb. I think that helps. With a bike path. Definitely. Absolutely. Obviously. OBVIOUSLY. Perfect for politicians who have no brains, which is, sadly, a higher than average number. I recently posted some photos of several close overtakes and a car going round a traffic island on the opposite side of the road to gain a few seconds. I was amazed the amount of vitriol that poured out, most of it ignorant and some threatening. The post was eventually removed from the group, but I was kindly sent a message outlining why. Interesting article here https://amp.theguardian.com/environment/bike-blog/2018/feb/05/why-are-politicians-getting-away-with-bike-lane-claims-based-on-hearsay?__twitter_impression=true. To anyone who has cycled the answer is so obvious, so keep chipping away at the powers that be and good luck with reclaiming the streets. I thoroughly approve of the children learning early that authority is not always right and protest is needed. Best of luck with the campaign and recruiting like minds, shame the cargo bike wasn’t in the photo though. I’m sorry to hear this. Did you report any of those traffic incidents to the police? Where did you post for them to receive so much vitriol? Was it a FB group? It was a FB group – Dunbar in Pictures, but it’s aim is to show off the town, so I understand why they deleted the post. I didn’t report the incidents as it was at night and the photos probably not clear enough for evidence. Were people defending motorists breaking the law? I’m having trouble understanding what the vitriol was about. The usual – road tax, jumping lights, taking up too much room on the road, slowing cars down etc. etc. I responded politely but realise arguing online with entrenched views seems to be a waste of time. Slowing cars down is a reason for segregated paths. And too much space on the road? How much space do cars take up? But yes, it’s probably not worth responding when the arguments are unreasonable. I’d already started a new blog, which includes this ride, about time I finished it. I did get a couple of negative comments on a FB post I made about the cycle path petition. I tried initially to respond with reason and civility but when it wasn’t returned I banned them. It was only two people. 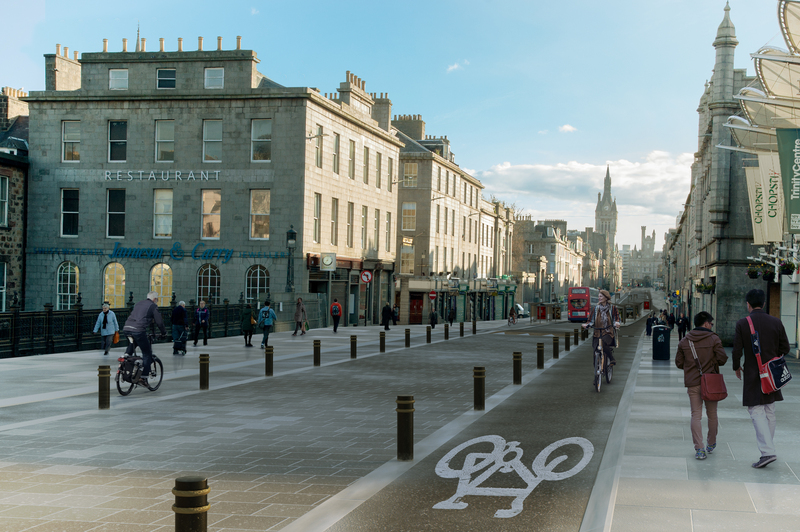 I was in Aberdeen last New Year and walked along the length of Union Street, noticing just how wide it was – 4 or 5 vehicle lanes – and how little of the building to building width was actually for people not in their cars. There was also a pinch point at the Music Hall steps, and the bus shelters take up a decent chunk of footway width so not great as a busy shopping street. Plus I had to cross a number of side streets – maybe some can be closed off for vehicles to remove conflict with the current footways and any added cycleways? Do you envisage having 2 or 3 lanes for vehicles, without bus lanes? Have you spoken to the bus companies, as they might be supportive (or at least not object to the plans)? Not sure if you’re aware of the website https://streetmix.net/ – would cool if you could find out the width of the street and road lanes, then recreate Union Street with the bike lanes to show what it would look like. There’s also data from traffic counters – https://www.dft.gov.uk/traffic-counts/cp.php?la=Aberdeen+City – which might be worth having a look at to see if there’s any traffic trends in the city you can pick out and use to your advantage. Thank you so much for those links. I hadn’t seen them before. The first one looks particularly good. Union St is so wide and so congested with motor vehicles. It’s an awful place to be a pedestrian and a cyclist. Electric buses are a huge coming trend. Are they on the agenda in Aberdeen? Good to see you pop up on Cycle UK email feed. Thanks! Cycling UK have been very supportive. I was also on BBC Radio Scotland yesterday!